Don't like having to look at the same desktop day after day? We can't blame you; we feel the same way. Just as some people have an ongoing need to redo their houses, we feel the urge to revamp our PC desktops regularly. Of course, remodeling your house costs a great deal of money--but renovating your desktop needn't cost much at all, if anything. Here we've rounded up ten great downloads that can give your PC a whole new look. Give them a try, and you won't mind looking at your desktop. 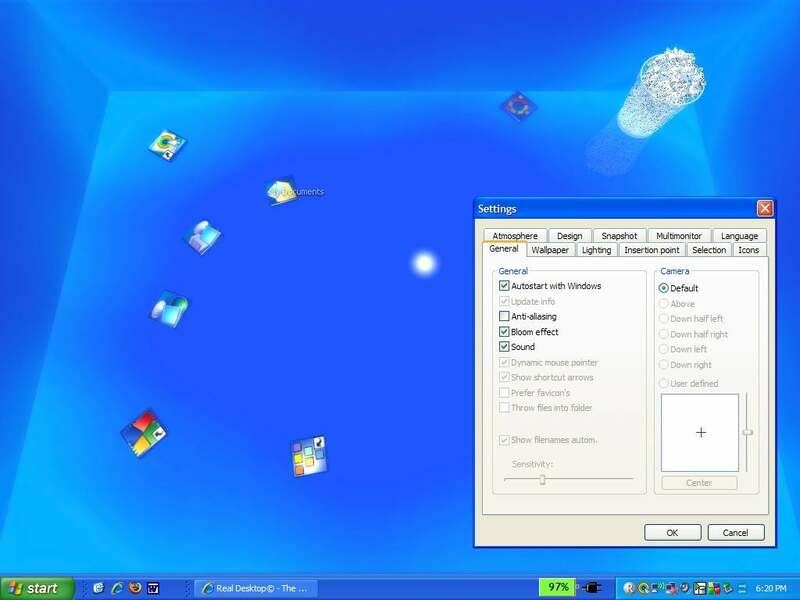 This program converts your desktop into a 3D virtual room, where you can place icons, shortcuts, and files not only on the floor but also along the walls. You can even place various objects into piles, or have BumpTop automatically group all your items into piles on its own. To see everything in a particular pile, you simply double-click the pile to view its contents laid out in a grid; from there you can use what you want, and then collapse the pile again. You can also create picture frames that can cycle through pictures on your hard drive, or that can instead show pictures obtained via RSS feeds. BumpTop gives you a few starter picture frames, but creating more of your own is easy enough. With this program you also have the ability to fling objects and watch them bounce, as well as to search for desktop objects. Additionally, you get access to an assortment of widgets, including one nifty item that will upload a picture to Facebook when you throw that picture onto the widget. All of that fun, though, does exact a performance hit: Your PC will run noticeably slower when you use this program. Nevertheless, it's quite entertaining, and useful for anyone tired of their old desktop. BumpTop comes in Free and Pro versions. The Pro version, which costs $29, adds more functions, such as the ability to use your mouse wheel to flip through all of the items in a pile. But you certainly don't need Pro--the Free program works just fine. "Good fences make good neighbors," Robert Frost famously wrote--and this program shows that they make good desktops, too. Fences does exactly what it says: It fences off parts of your desktop and devotes them to certain things, such as applications, Web links, folders, recent items, files and documents, and more. 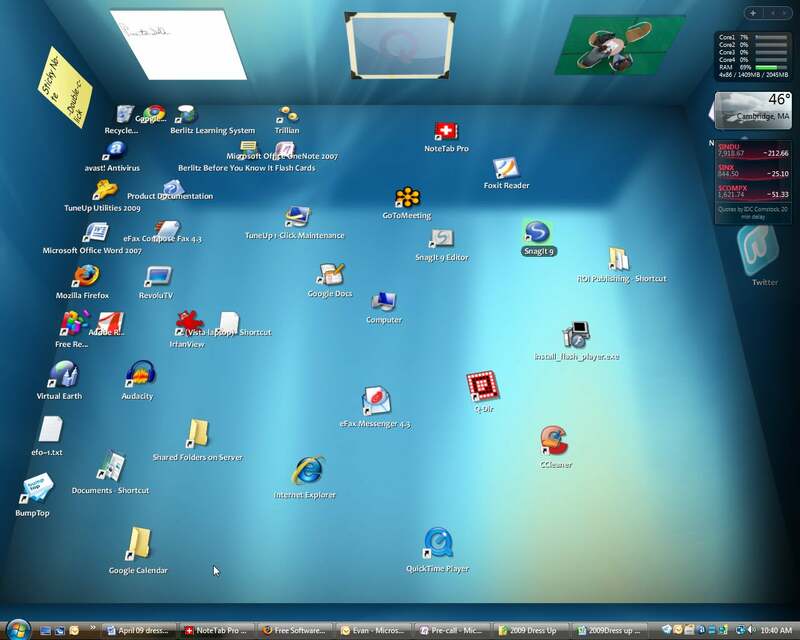 That way, instead of having to search through your disorganized desktop for an item, you just go to the appropriate fenced area and find it immediately there. You can customize Fences to create your own categories, and you can place any objects inside the fences you want. You can also control the number of fences and where they're located, as well as customize the fences' transparency, brightness, and colors. And a very nice feature lets you dismiss or restore all of your icons with a double-click on the desktop. Unlike with 3D desktops, with Fences your PC won't suffer slowdown. Though Fences is not quite as nifty-looking as 3D desktops are, it makes organizing your desktop easy, without any detrimental effect on performance. Given that it's free, it's well worth the download. 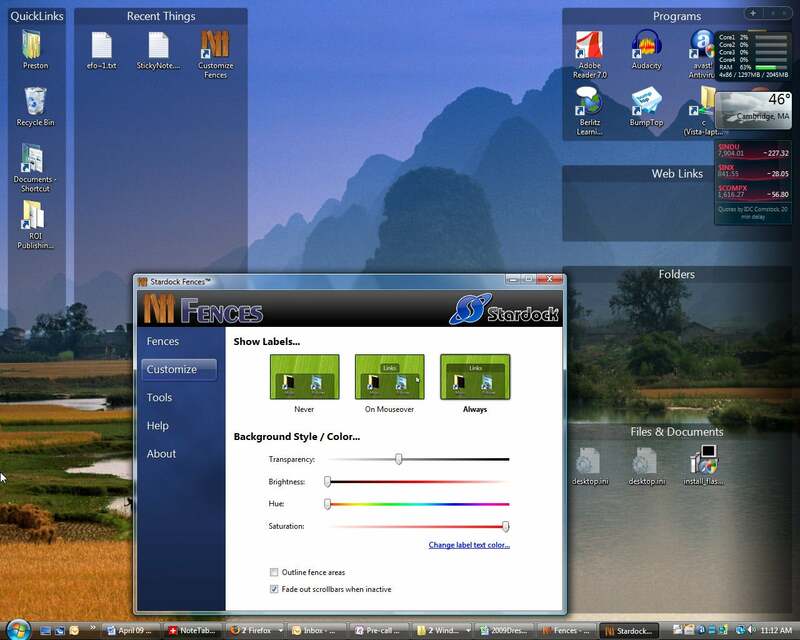 MagicTweak is a great program for adjusting how Windows looks and works in countless ways. 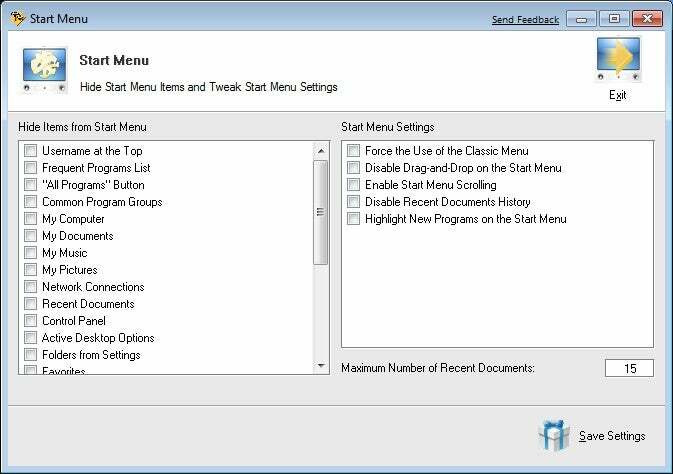 Begin with the Start menu: With this tool you'll be able to hide many items from the Start menu, including everything from My Computer to Recent Documents. You can even hide the Control Panel, if you'd like; you can also force the Control Panel to use its "classic" look, and disable drag and drop on it. You can determine how Windows Explorer appears and acts, too. Though this utility gives you many options for customizing Windows' appearance, that's only the beginning. Even more powerful is this program's ability to alter how components of Windows work. Among other options, you'll find tweaks for security and for your network connections. One of the quickest ways to dress up your desktop is to change your icons--or better yet, create new ones of your own. You don't have to be a Michelangelo to do it: Through this program you can make icons easily, even if you don't have a shred of artistic ability. 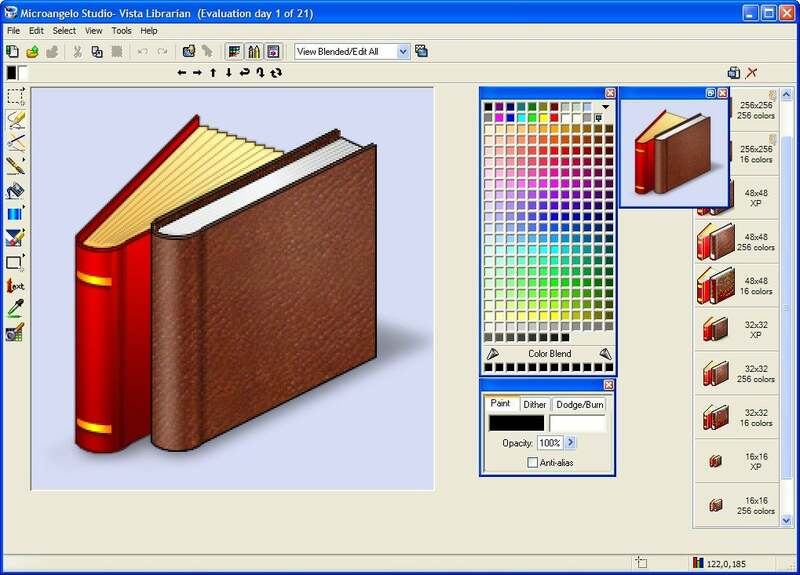 You'll be able to design icons in any color format and any size, including icons appropriate for Vista and for XP. Those with little artistic talent will want to start off by importing a graphic into the program. Just find one you like (such as by searching with Google Images) and then import the graphic--the program automatically converts it into an icon. Afterward, with the program's simple-to-use tools, you can clean it up so that it's suitable for an icon. If do you have artistic skills, all the better: Paint tools, drawing tools, and specific icon-creation tools are all at your disposal. You'll be creating or editing icons in no time. Beyond the icon-creation tools, Microangelo also lets you manage your icons, browse through your icons, and even make animated icons. This freebie doesn't merely dress up your desktop--it thoroughly transforms your desktop into a three-dimensional one. More than that, though, the objects on your desktop become virtual objects that you can rotate, move, and even throw against one another. They react just as if they were real-world objects; they have weight and physical dimensions, and behave accordingly. For example, when you throw one object against another, the items crash, clink, and slide. You'll find a lot of playfulness in this program (the Recycle Bin, for instance, becomes a 3D trash can). But you'll like the app not just for its whimsy but also for its usefulness. It makes finding what you want on your PC much easier.